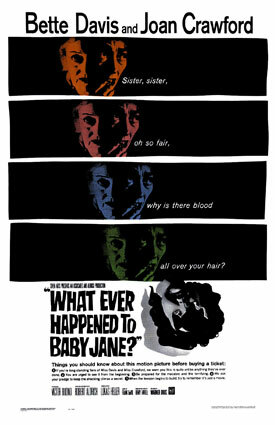 The poster for the 1962 film. . Wallpaper and background images in the What Ever Happened to Baby Jane? club tagged: photo what ever happened to baby jane baby jane hudson blanche hudson. This What Ever Happened to Baby Jane? photo might contain newspaper, paper, magazine, tabloid, rag, anime, comic book, manga, and cartoon.